This is a comprehensive list of Enya’s videos including obscure early versions and specials filmed for TV. If you want to watch the music videos head over to the media page. If you want to buy them, I recommend reading this summary of Enya dvds that’s part of my ‘Collecting Enya’ series. You have choices, y’know. Unless your are Enya filming your first video and they tell you to dress up as punk Boadicea because then you don’t. A great majority of Enya’s videos are filmed in studio. The entire forest featured in ‘Amarantine’ was digitally painted by Charles Darby and all exteriors in ‘Wild Child’ were part of an elaborate set. But there are exceptions, ‘The Celts’ was filmed in Bodhaim Castle, England; ‘How Can I Keep From Singing?’ in Poison Glen, Ireland and ‘Only If…’ in Mentmore Towers, England. The complete list can be found at the video locations page. Some of Enya’s earlier videos borrow visuals from existing paintings. ‘Caribbean Blue’ and ‘Anywhere Is’ are nods to works of the American painter and illustrator Maxfield Parrish. 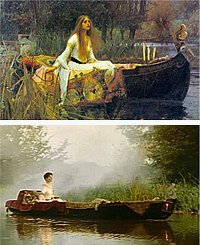 ‘The Celts’ costume and lake scenes were inspired by ‘The Lady of Shalott’ by John William Waterhouse. ‘On My Way Home’ briefly refers to ‘Carnation, Lily, Lily, Rose’ by John Singer Sargent.